The Cumberland & Dumfriesshire Farmers Mart P.L.C. 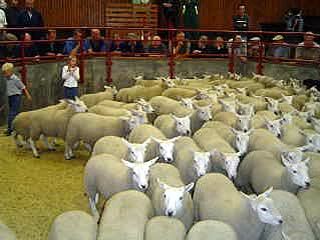 had forward 2,671 store lambs at their weekly sale at Longtown on Tuesday 10th August 2010. A very good show of store lambs were dearer and short of requirements. Top of £71 for Texels from Taylorburn, others £69.50 and £68 Fairgirth; Suffolk £65.80, £64 Fairgirth; Greyface £62.80 Taylorburn, £56.50 Stonehall, £56 Bateyshield and High Edges Green £55 Nethertown and Morley Hill; Cheviot Mule £60 Old Hall; Charollais £55.20 Nethertown; Lleyn £53 The Mark; Hill Northies £46.80 Kelsocleugh. Greyface ewe lambs to £68 Old Hall. Included in the sale was the Annual consignment from Fairgirth, Dalbeattie for Messrs Jardine, his top price was £71 and averaged £59.60 (up £13.04 on the year).